Have you ever wondered why some people are so unlucky? No matter what they do or how hard they try, they can’t seem to get a break. Some might believe it’s bad luck, a curse, a spiritual blockage, or a soul contracts we agreed or created from a previous life time. However, what if none of this is the reason behind the struggles in our life? What if something else is holding us from living the life we strive and work so hard for? In my spiritual journey, I came across something I never heard of and was dumbfounded at what I was informed about. I tried to attain information about this particular subject, but there was limited information. Intrigue and with the subject, I decided to ask my guides to provide me with knowledge on this particular topic. I was very surprised with the information I was provided and how naturally I was able to implement this particular healing with minimal difficulties. What I realized was there are energy imprints created by our ancestors through the trauma they endured in their lives and never even realized it. Our family not only passes their physical genetic makeup, but they also pass on their energy /beliefs on how they perceive or interpret their life on to their descendants. The trauma they endured created a coping skill to prevent any more harm to occur to them and future descendants, which created an energetic contract with imprints of their perception and interpretation of the situation they endured. When this contract was created there were no malicious intent to cause harm or the thought of leaving generations of descendants bonded and feeling stuck from living their full potential. In removing the generational imprint, one has to convince/heal the ancestor who crossed over to release the energy contract they left to their descendant. Let me give you an example, by using a fictitious character to provide you a clearer picture of what I am talking about. Imagine Mary always doing her best in everything she did to get ahead without ever asking for help, however, no matter what she did or how hard she tried she always struggled financially in her personal and professional life. Mary did everything right: college, her own business, saving, investing, and being mindful about what she spent her money on, but she always seem to fail. She knew somehow this had to change but could not grasp how too. She always sensed there was more to her struggle, but could not understand where it was coming from or how to resolve it. Until she came across a particular healer who informed her, this was not her fault or a soul contract she agreed on from previous lifetime, but the bond/ chain was caused by an imprinting of her ancestor energy through trauma they endured. 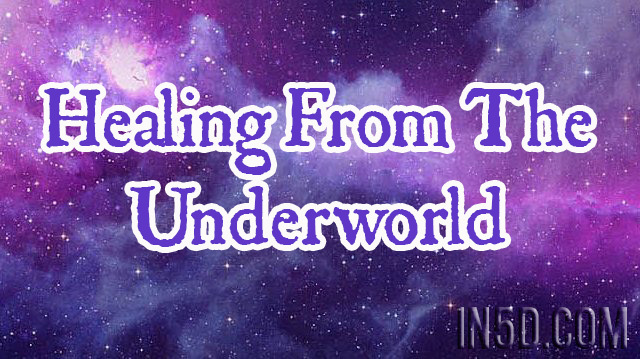 To start the healing process one has to journey to the “spiritual underworld”, which is where many lost souls remains with contracts that ingrained beliefs due to an unfinished business or traumatic event in their life. For Mary, what was discovered through the journey of the “underworld” was her grandmother as a young child seemed guarded and pushed people away from her, especially when they tried to be nice or offer her help. Mary’s grandmother grew up from a wealthy family and everything seemed to be defined by wealth and how much money was accumulated. Money played a major factor in Mary’s grandmother’s upbringing, her parents were driven by it and were constantly working and never around her. Grandmother grew up a majority of her childhood cared for by her nanny and servants. Mary’s grandmother would constantly beg her parents to stay home and spend time with her as a child, but the reply was always the same “they can’t”, because they had to work to provide for the lifestyle she was accustomed to. One day while working in the “wee hours” of the night, grandmother’s dad passed away unexpectedly from a heart attack, leaving grandmother heartbroken and feeling guilty. She struggled to cope with her dad’s death and started to believe she was the reason her dad passed away and if she wasn’t such a burden her dad would still be alive. Two beliefs were instilled due to the trauma the grandmother endured, which created an ancestral energy imprinting to its descendant. The guilt due to her trauma created a belief that money only brought pain and suffering so get rid of it as quickly as possible and do everything on your own so you will never be a burden on anyone. The subconscious contract that was written was in order to avoid feeling pain or a burden to someone was to live with very limited amount of money or in poverty and never rely on others no matter what. As the grandmother grew up and had her own family, she raised her children different from her upbringing. She lived a very simple and humble life and did everything on her own and refused to accept help from anyone due to the trauma she endured. To be able to break this genetic imprinting or contract the grandmother had to realize her father’s death was not her fault and she was never perceived as a burden to her father. The grandmother had to understand the coping skills she acquired to deal with her grief caused more harm to her, her family, and it prevented her granddaughter from living her potential in life. When the grandmother was able to grieve properly and feel safe to let go of the belief and coping skills she created to deal with the trauma, she allowed herself to be free and move on; which released the energy contract she created. As for Mary once the generational imprinting was removed it allowed her to feel empowered and worthy; to seek out advice and help from others to create a successful business that abundantly flourished without having any emotional or financial stress. Helping someone who has crossed over an opportunity to heal creates a sense of safety instead of fear as move on contract free and it also allows family lineage to heal and live life without blocks or contracts, but freewill. It also gives us insight the importance of nurturing oneself; especially when something traumatic happens in our life, because we don’t know what punitive beliefs we create due to the trauma we might endure or what generational imprints we may leave behind when we pass. While we have the chance always remember to not live in fear, but to nurture and love one’s self each and every day. About the author: Started back into her spiritual journey about 2 years ago after suppressing many of her gifts for many years. Since returning to her life’s purpose she continues to love every second of it. First and foremost, she continues to be a student of life and through her experiences has been given the blessing to share various perspectives , knowledge , and inspire others by helping them find the their unique truth and purpose by using Reiki and different modalities of healing or connecting with spirit for guidance to help others in their life path.